A real character in and out of the ring. Medium advance dressage hunter trials BSJA. A true all-rounder with too many wins to mention. Qualified Scottish farmer elementary (3rd in finals), Blair working Hunter, Thelston working hunter, BSJA foxhunter 2rd round. Witicker ridden middle wight Hunter and working hunter. He is a real show man and a gentle giant, the smaller the person the more he looked out for them. 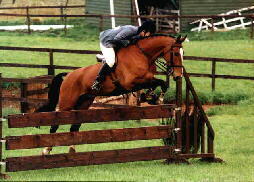 His only vice was that he loved to chase ponies especially around a cross country course.